Automation Triggers Are the First Step in Automation. So What Are they, Exactly? An automation trigger is an initial input that kicks off the activation of an automated workflow. In a sense, an automation trigger is, quite literally, the first step in automation. Automation triggers can kick off an entire automated process in response to web-based, email-based, manual, or application-based input. Taking a step back, automation itself the use of equipment, processes, or systems to perform tasks that might otherwise have been attempted manually. But with modern-day software automation, entire organizations are taking advantage of application programming interfaces (APIs) and serverless computing to innovate their processes and rapidly grow their businesses. In practice, automation of this sort uses software to perform time-sensitive business tasks, which would either take too long or are simply too big or data-intensive to handle manually in any reasonable period of time, on your behalf. Automation of this sort typically requires integrations - connections between the major software components of your technology stack that enable them to talk to each other and share important data, such as lead lists and customer invoices. Automation adds efficiency and speed to processes in marketing, sales, support, finance, and many other disciplines. They excel at handling big tasks that require flowing significant amounts of data from one place to another - processes that would be unreasonable to attempt manually, and would introduce tons of human error. What’s the benefit of streamlining business processes with automation? 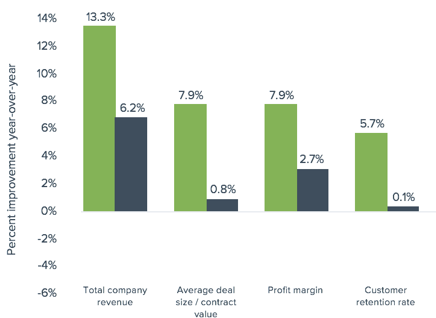 Research firm Aberdeen Group found that organizations that take advantage of smart process automation capture 2.2x more revenue, 2.9x higher profits, have deals that average 9x higher, and see exponentially higher customer retention than those that don’t. OK. So what’s an “automated workflow”? Automation trigger: The initial stimulus that initiates the subsequent steps of the process. Workflow processes: The actual “work” of the workflow - whether that be lead tracking from your marketing automation platform (MAP), updating sales prospects in your customer relationship management (CRM) solution, or any other process or combination of processes that involve validating, transforming, and/or flowing data from point A to point B. End result: The final product of the workflow, such as an updated database, or a properly-formatted comma-separated value (CSV) document of important business data. So why are automation triggers important? What should you look for? Automation triggers are important because they act as the stimulus-response step to begin your automated workflows. You also need automation triggers that can handle your specific needs. You won’t get far with automation triggers that frequently fail, or can only initiate workflows from a very narrow set of inputs. One of the most important benefits of automated workflows is their ability to proceed without having to babysit them manually. To get the full value of automation, you need workflows that dependably kick off their processes every time they encounter a valid trigger. The more types of automation triggers you have at your disposal, the better. Good automation platforms provide multiple avenues to kick off workflows, not simply including manual triggers, but also including the ability to initiate processes according to a pre-set schedule; or the ability to start a workflow on receiving an email input; or in response to a marketing form fill...among others. Best-in-class automation platforms even include a variety of app-specific triggers that you can use to trigger automated workflows in response to changes in your CRM, marketing platform, outbound email automation, and more. One of the most important aspects of automated workflows is working in an environment that is flexible enough to allow for tinkering and iterative upgrades as your tech stack changes. In the same way, it’s important to have the ability to quickly swap different automation triggers into your workflows to better customize them over time to your company’s changing needs. What kind of automation triggers are there? And how can you master them? Below is a list of automation triggers for you to familiarize yourself with. Get a full briefing on each trigger, plus sample use cases and sample automated workflows, in The Beginner’s Guide to Automation Triggers. You should now have an idea of what automation triggers are and how they work. To take an in-depth look at each style of automation trigger, with full use case lists and example automated workflows, get the full, non-excerpted guide, “The Beginner’s Guide to Automation Triggers: The First Step in Business Automation,” here. Learn how to use automation triggers by joining our weekly group demo.